August 1863 finds two con artists traveling with their embezzled cash to build their dream ranch in Washington Territory. But some Cheyenne Indians have different plans for those white settlers heading west, plans that cause the story of our con artists to become three stories. 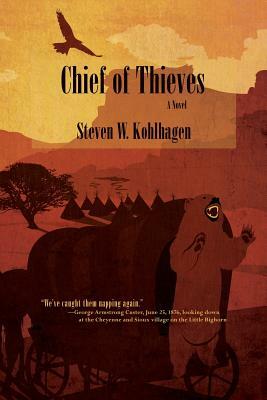 "Chief of Thieves," the sequel to Kohlhagen's "Where They Bury You," takes the reader into the disasters of early Western ranch life and the births of lawless Wyoming towns; inside Cheyenne villages and tipis, where this hunting civilization of people, called "the greatest horsemen and cavalry the world ever saw," lived, raided, and were attacked and massacred as they slept; and into the relentlessly driven lives, internal conflicts, and battles of George Armstrong Custer and his Seventh Cavalry. The three stories interweave at an ever-quickening pace, from Colorado negotiations to battles in Oregon, Wyoming. Kansas, and what is now Montana, including the massacres at Sand Creek and the Washita River, before culminating on a beautiful June 1876 day on the Little Bighorn River. Custer's Little Bighorn decisions under fire in real time become understandable on these pages as death comes to historical and fictional characters, con artists, U.S. soldiers, and Cheyenne alike, and the three stories merge climactically on that fateful day in American history. "Chief of Thieves" is based on the factual story of how Lieutenant Augustyn P. Damours conned the U.S. Army, the Catholic Church, and the New Mexico Territory out of millions of today's dollars. Steve Kohlhagen is an award winning author, former economics professor, and former Wall Street investment banker. "Where They Bury You" was awarded the Best Western of 2014 by the National Indie Excellence Book Awards. Steve and his wife, Gale, are the authors of "Vanished," a murder mystery, also from Sunstone Press. They divide their time between their homes in the San Juan Mountains of Colorado and Charleston, South Carolina.